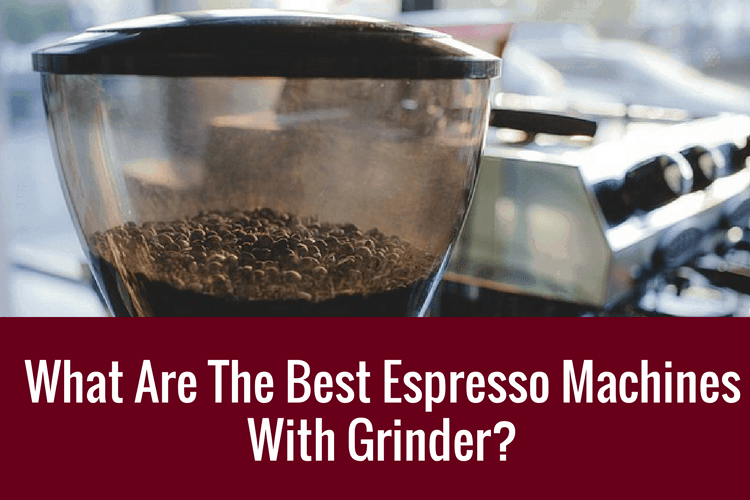 [REVIEW 2019] What Are The Best Espresso Machines With Grinder? What Are The Best Espresso Machine With Grinder? Espresso machines represents convenience and it can only get more convenient as manufacturers catches up with consumer trends. When looking for an espresso machine with a built-in grinder, you may not know where to start looking. Sometimes you may not be able to see the grinder, so would be unsure of what to look for. That is exactly where we come in to fill your knowledge gap! Why Look For One That Has A Built-in Grinder? Nowadays, you can find espresso machines in all shapes and sizes depending on the functions that are available within the machine. Having one with a built-in grinder helps immensely due to the space and time saved from already having one built in. All you need to do is put coffee beans in and wait for the magic to happen. If you want to get an espresso machine with a built-in grinder then there are many benefits. One such benefit that is important is that it is all already there. You don’t need to go out and buy a separate grinder to enjoy your coffee. This also means that you don’t have two separate machines to do different functions. You also do not have to worry about grinding your coffee machines so that they work with your machine, as the machine does this for you. If you enjoy outstanding coffee but don’t want the hassle of grinding your own beans every morning then a built-in grinder is for you. An espresso machine with a built-in grinder is quite a bulky piece of machinery, so before you buy, make sure that you have the space for it. You will need to know the measurements if you have a smaller area that you have dedicated to your coffee maker, so make sure you know what you have before buying one. ​The more feature a product have, the higher the price tag. As if they include the grinder, they tend to be more complicated machines. The other is potential higher replacement costs. If the model does not have individual replaceable parts, imagine if your grinder fails but the rest of the machine is still working but you still have to buy a entirely new machine. To avoid complications, take a look at what we got below. An improvement from the previous BES860XL. This machine boasts a 15 bar Italian pump that will keep your coffee drinking experience to the highest standard. With the built-in grinder, you no longer have to worry about grinding your own beans, just sit back and let the machine do its job. To make it better. The Purge Function automatically adjusts water temperature after steam to optimise beans extraction for flavor. This machine needs to be kept very clean to keep up to its high standards but if you look after it, it will look after you, supplying you with fresh coffee for a long time. The grinder itself is easy to clean so it does not get clogged with remnants of ground beans. This machine lets you not only make espressos, but also cappuccinos and lattes with the built-in milk frother so you have more options when choosing your cup of coffee. Even though it may not be as quick as espresso machines that use capsules, you will enjoy your cup of coffee quickly and will feel like your own barista with all the added functions. Coming in several finishes, you can choose between Cranberry Red, Black Sesame, or the timeless stainless steel. What about after sales support? In the unlikely event that you machine do break down, Breville will usually replace the broken down machine with a brand new one. This machine, from Gaggia, has everything you need from an espresso machine. Not only does it include a milk frother for other types of coffee. The machine itself is sturdy and comes with a 1 year warranty in case of any problems with it. With a fully adjustable grinder, you can choose how you want your coffee depending on your personal preference. So, you can now grinds your coffee beans extremely fine for a smoother and richer taste. The machine is easy to clean with a drawer that pulls out so you can wash away the dregs of past coffee and the water reservoir is easy to remove to fill up. The frother is simple to use and opens your options up to more than just espressos, meaning you can open your eyes to the other coffee choices that are available. The machine does washes itself automatically which is a good thing but also means that there might unnecessary water in the drip tray. This can cause a real mess if it overflows and if you didn’t notice, could lead to a real problem in your kitchen from the excess water. Overall, this machine is a good choice with many functions to suit anyone. De’Longhi have brought out many models in the past. Among these, the Magnifica ESAM 3300 is an extraordinary piece of machinery. It has many different functions to suit both the casual coffee drinker and the more experienced connoisseur. This machine allows you to be your own barista. With the patented boiler, it makes consistent brew at the ideal temperature. Add this with the simple user interface, your morning coffee fix is made more enjoyable. The built-in grinder makes little to no noise, and you are able to choose how fine your beans are ground, meaning you can personalize your cup of coffee to suit your needs. The removable brew group makes cleaning of the machine so much easier and thorough as you can pop open the unit to clean. Programmable function allows the machine to remember your preferences once you set them. Now you could get your own unique blend everyday. Overall, this machine can be extremely reliable and a good purchase for any keen espresso drinker. This machine features a 60 ounce water tank that lets you know when it needs to be refilled, so you don’t need to keep checking it. With an LCD screen, so you can see what you’re doing, making coffee can’t be simpler. The machine heats water real fast so it proves itself usefulness when you are rushing for time. The built-in grinder will freshly grind your coffee beans just before it starts brewing to allow for maximum freshness in your morning joe. To clean it, you merely have to pop open the ground compartment to take it out. The machine has a simple to use user interface (UI), so there is no steep learning curve to it. If you want to do next to nothing to make your coffee. You can consider this model. This sleek machine, with a stainless steel finish, will fit into the color scheme of anyone’s kitchen. The bean hopper can carry up to 10 ounces of beans so less changing for you. With a stainless steel make would be preferred, this ceramic grinder still does the job well - press a button and get your grounds. The grinder itself has up to 10 settings, so you can pick how fine you want your coffee ground, meaning the coffee you are drinking is more personalized to suit your needs. Made in Italy, you will be getting an authentic, fresh tasting coffee of a morning. Do remember to keep the grinder well clean from time to time or it might get clogged. As a super-automatic,this would have a milk frother included so you can enjoy more than just espressos of a morning and branch out into other coffees if you want. This sturdy espresso machine is good for anyone who loves coffee. As always, all machines have their upsides and downsides, but one is probably a better first choice as the better machine than the rest. The Breville BES870XL is an extraordinary piece of machinery, with many different functions that will suit anyone. It is a sturdy machine and the built-in grinder is extremely durable meaning your coffee grounds will stay fresh for the perfect cup of coffee. The size of the machine is 12.5 x 13.25 x 15.75 inches, so it is not a small machine, but it will fit in nicely in your kitchen if you designate it enough space. It is an easy to use machine with many different functions so anyone can use it and enjoy the coffee that comes out of it. The one-year warranty also allows you to change your machine if it breaks down, so you are covered if anything goes wrong. Overall a quality machine with a built-in grinder that would be essential in any home.